"I'm Nobody! Who are you?" by Emily Dickinson is the Songs of Eretz Poem of the Day for April 30, 2014. This poem is in the public domain and therefore legally reprinted here. Miss Dickinson's poetry has been reviewed several times in Songs of Eretz. A review that includes biographical information may be found here: http://eretzsongs.blogspot.com/2013/12/review-of-its-all-i-have-to-bring-today.html. Emily Dickinson certainly practiced what she preached in "I'm Nobody." She never married, hardly ever left her home, and composed hundreds of poems but did not allow a single one to be published during her lifetime. Ironically, there is no doubt that Miss Dickinson was "somebody." 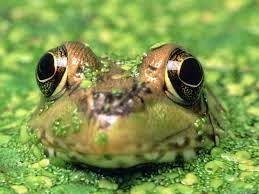 She did not proclaim her name "like a Frog," but achieved fame and even a measure of immortality nevertheless. She certainly had disdain not only for the vociferously well-known, but for their admirers, whom she compared to a "bog." "Minot's Ledge Lighthouse" by Fitz James O'Brien is the Songs of Eretz Poem of the Day for April 29, 2014. It was first published in Harper's New Monthly Magazine in 1861 and is therefore in the public domain and legally reprinted here. I came across this poem after a Friend of Eretz submitted a poem to the e-zine inspired by the story of Minot's Ledge Lighthouse. The original lighthouse (pictured) was completed in 1850 and stood on cast iron supports off Cohasset, Massachusetts, a particularly violent part of the Atlantic Ocean. In 1851, a newspaper reporter by the name of Gordon spent a stormy night in the lighthouse along with Keeper Bennett. The Keeper confessed to Mr. Gordon that he was worried about the structural integrity of the lighthouse. 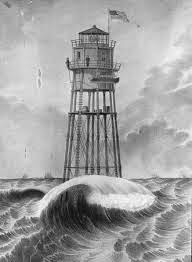 Days later, the lighthouse was swept away by the sea with the loss of two out of the three keepers who were manning it at the time. Reference to this and additional historical information may be found here: http://lighthouseantiques.net/Minot's%20Ledge%20LH.htm. The red-eyed light-house lifts its form. Their curses on the sturdy wall. The imprecations of the night. And seeks a shelter any where. Who used to gayly climb his knee. That sullen thunder through the room. A ship upon the shoal to-night! And trust in the Almighty power! And wild but fearless hazel eye. Out with the hooks! One mighty fling! Adown the wind the long rope curls. While the wild ocean wilder whirls. A steady pull. - It tautens now! The breathing body of his boy. Within, there is the peace of God. Fitz James O'Brien (pictured) was born Michael O'brien in Ireland in 1828. 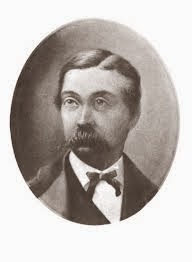 He emigrated to the United States in 1852 and began contributing poems and short stories to various serials. He is most famous for his science fiction short stories which profoundly influenced not only the development of the short story form but the development of the science fiction genre as well. He died in 1862 of a wound infection in the War Between the States. Reference to this and additional biographical information may be found here: http://www.sf-encyclopedia.com/entry/obrien_fitz-james. The use of octets and iambic tetrameter are reminiscent of a ballad, but the rhyme scheme is much more rich and complex than the usual ababcdcd of the ballad form. The poet adroitly employs alliteration, consonance, and sibilance to his advantage, creating sounds like that of a violent, stormy sea. The lighthouse itself is brought to life as a kind of "red-eyed" cyclops; the sea is transformed into a horde of raging, clutching, howling demons. However, unlike the real-life fate of the lighthouse and its keepers, here the poet indulges in a happy ending, as the pious keeper is able to rescue his beloved son. Would the poem have been more powerful if both keeper and son were claimed by the sea? 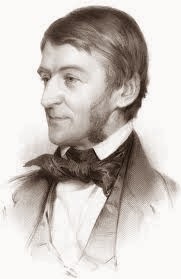 "A Nation's Strength" by Ralph Waldo Emerson is the Songs of Eretz Poem of the Day for April 28, 2014. It is in the public domain and reprinted here. Ralph Waldo Emerson (1803 - 1882) (pictured) was the chief spokesman for the Transcendental Movement, a reaction against scientific rationalism. The Transcendentalists believed that intuition, rather than observation, was the best way to understand the universe, and that the entire universe could be understood and appreciated by contemplating the smallest part of it. Emerson is perhaps more famous for his essays than his poems. Reference to this and additional biographical information may be found here: http://www.poets.org/poet.php/prmPID/201. "A Nation's Strength" is a ballad that I wish all of our elected representatives would be required to read. Far too many of them believe that thoughtless expenditure of treasure, mindless military might, and false pride or nationalism for nationalism's sake are what make our nation strong. And, sadly, far too many individual voters allow them free reign to indulge in their fallacious philosophy. "The World Is Too Much With Us" by William Wordsworth is the Songs of Eretz Poem of the Day and the offering from Poet.org's Poem-A-Day for April 27, 2014. The poem is in the public domain and reprinted here. 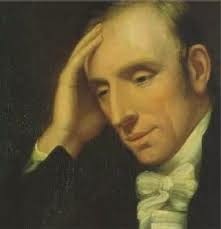 William Wordsworth (1770 - 1850) (pictured) was a major poet in the English Romantic movement. He traveled throughout Europe for almost his entire life, and his observations in his travels profoundly influenced him. He was one of the first English poets to favor lyrical over epic poetry and the speech of the "common man" over the highly formal speech that was favored by the poets before his time. Reference to this and additional biographical information may be found here: http://www.poets.org/poet.php/prmPID/296. Well, for a poet who favored the speech of the "common man," we have here a traditional, old-fashioned, Italian sonnet (8 line set-up and 6 line punchline in good old iambic pentameter), complete with references to antiquity. 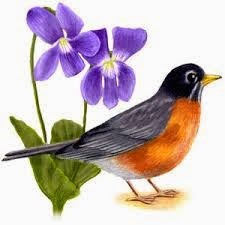 However, it is certainly lyrical, and its message--that the beauty of Nature (with a capital N) is something worthy of the gods of old--is certainly a romantic one. "Once in the 40's" by William Stafford is the Songs of Eretz Poem of the Day for April 24, 2014. A link to the poem may be found here: http://www.poets.org/viewmedia.php/prmMID/16507. 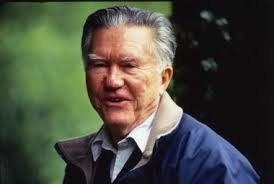 Kansas native William Stafford, Ph.D. (1914 - 1993) (pictured) was a teacher at Lewis and Clark College in Oregon. He published his first book of poetry at the age of forty-eight (which gives me hope! ), and followed that collection by sixty-four more between poetry and prose. He served as the Consultant in Poetry to the Library of Congress in 1970, a position now known as Poet Laureate of the United States. Reference to this and other biographical information may be found here: http://www.poets.org/poet.php/prmPID/224. "Once in the 40's" is a mystical, magical vignette about a moment of perfect contentment and the recognition of that moment for the treasure that it is. Here we see the poet and his wife literally at a crossroads in the middle of nowhere on a long, dark road in Montana. 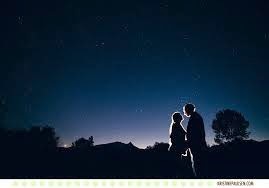 It's cold, but the stars are out and watching over them. They are deeply in love. They vow that no matter how rich and successful they become, that they will one day recapture the stillness and beauty of this moment, no matter the cost. This poem of just eleven lines of free verse is a slice of time yet timeless. 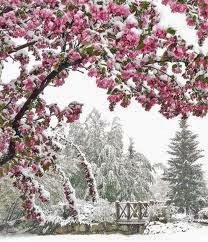 I was in a reverie when I finished reading. "A Poison Tree" by William Blake is the Songs of Eretz Poem of the Day for April 23, 2014. It is in the public domain and reprinted here. 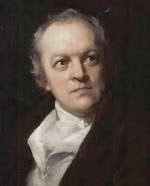 William Blake (1757 - 1827) (pictured) was a poet, painter, engraver, classical scholar, and outspoken libertarian political radical. He favored creativity over reason and poetry inspired by inner feelings rather than observation of nature. He was considered a genius by some, insane by others. 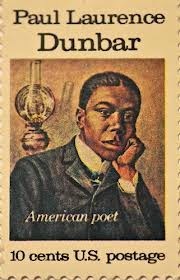 Reference to this and additional biographical information may be found here: http://www.poets.org/poet.php/prmPID/116. 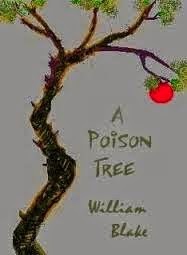 "A Poison Tree"is a traditional ballad about revenge over one's enemy. The conceit of the poison fruit is an old one (Snow White, Genesis, Persephone) but given a nice twist here. The nicest thing about this poem is that there is no saccharine "moral lesson" about the effects of revenge on the seeker thereof. 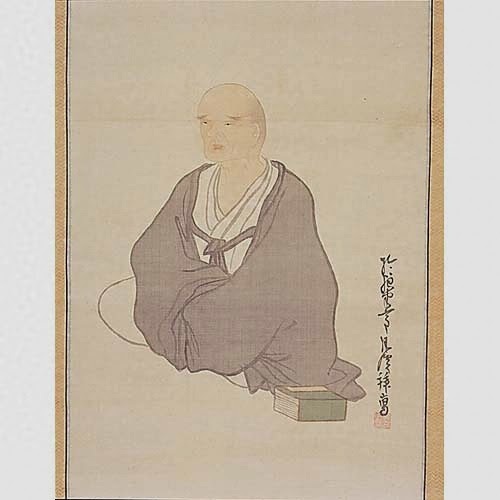 On the contrary, the speaker reveals in the first stanza that he is capable of overcoming his anger in the case of a dispute with a friend but deliberately chooses not to exercise this ability concerning his enemy. Bwa ha ha! 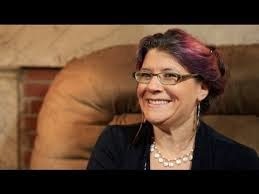 "When They Die We Change Our Minds About Them" by Jennifer Michael Hecht is the Songs of Eretz Poem of the Day and the offering from Poets.org's Poem-A-Day for April 22, 2014. A link to the poem, including the poet's notes, may be found here: http://www.poets.org/viewmedia.php/prmMID/23957. Poet and historian Jennifer Michael Hecht (b. 1965) (pictured) is a teacher at The New School. Her credits include two award-winning poetry collections and several works of highly-praised non-fiction. Reference to this and additional biographical information may be found here: http://www.poetryfoundation.org/bio/jennifer-michael-hecht. The poem is organized in four, free-verse stanzas following the pattern quintet, triplet, quintet, triplet. The final two lines have such a strong assonance that they nearly rhyme. The message or history lesson, summarized in the title, is interesting and thought-provoking. As I read, I was reminded of President Gerald Ford's funeral. While he lived, the media portrayed him as a bumbling fool. 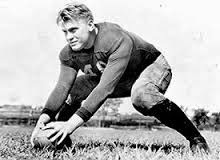 The same media eulogized him as the right leader at the right time, star athlete (pictured--yes, that is a picture of Gerald Ford), and healer of the country in the wake of the Watergate scandal. How much more could Ford have accomplished if were treated in life the way he was treated in death? Sadly, we will never know.